Part of the New England region of the United States, Connecticut is one of the smallest states in the entire US, but boasts some of the best statistics in the nation in terms of average household income. There are a lot of great things to do in Connecticut, ranging from museums, casinos, and historical sites to live shows, beautiful parks, thrilling wildlife areas, and outdoor activities. It can seem like a bit of a challenge to take to a roller skating rink for the very first time, but once you start speeding around like a superhero, you'll see just how fun it can be. Connecticut is home to several roller skating rinks offering attractive entry fees and special events like birthday parties, summer camps, and lessons, as well as tasty food and good drinks to enjoy afterwards. Here are some details on some of the best roller skating rinks in Connecticut. These days, it’s easier to find an ice skating rink than a roller skating rink, but Connecticut is still home to several top quality roller skating locations for all the family to enjoy. If you’re looking to do some roller skating in Connecticut or New England in general, check out the locations listed below. Nestled in Middletown, Connecticut, the Middletown Roller Skating Rink is open all week long, even on Sundays, and welcomes people of all ages and experience levels. The motto at this Connecticut skating rink is "Healthy fun for all" and the staff aim to welcome every visitor with the same enthusiasm and friendly attitude, encouraging everyone give roller skating a try. This skating rink runs a whole host of varied special events and can be booked up for birthday parties, scout reunions, school field trips, church events, skating lessons, summer camps, and more. Adults-only evenings run every week on Mondays and Thursdays too, and the whole rink can be booked up for private parties of groups of 20 or more skaters. All skates are provided by the rink and the cool 70s/80s deco adds a classic retro touch to this fun location. Sitting in the Connecticut town of Waterbury, Roller Magic skating rink aims to bring the magic of roller skating to life for all generations, kicking the magic of this super sport into the 21st century with style, welcoming kids and adults of all ages onto the rink for hours of unbeatable fun and skating excitement. Birthdays, scout reunions, graduation parties, family reunions, and more can all be enjoyed at this awesome roller skating location, which also features a full snack bar, video game arcade, disco-style lighting, powerful sound system decked out with the latest tunes, lockers, air conditioning, free parking, and many other services and amenities to make your Connecticut roller skating experience as enjoyable as it can possibly be. Ron-A-Roll Indoor Roller Skating can be found in the Connecticut town of Vernon. This rink is a highly popular local gathering spot, hosting birthday parties, school trips, work place outings, and much more. Each and every week, new and exciting events are being held at this location, including skating lessons, cheap skate sessions, evening skates with fun music, and more. 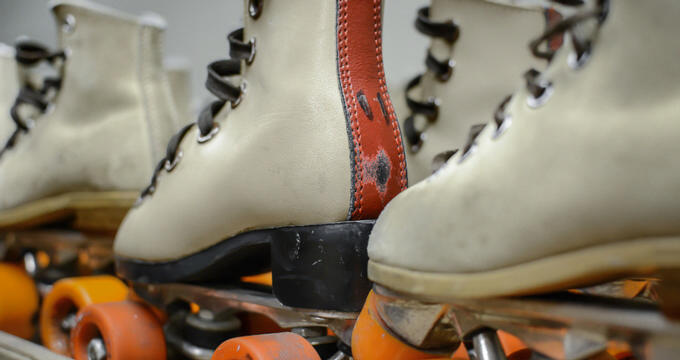 The rink itself covers an area of over 14,000 square feet, and high quality roller skates can be rented from the rink's offices. A fully-featured snack bar is available, along with private party rooms, video game machines, lockers, an eating area, light and sound special effects, an in-house DJ, and more. This Connecticut skating rink also runs 'Rollerdurance' events every Monday night, perfect for people who want to keep fit, improve their skating technique, and have fun with new friends. Roller derby teams love these events, but Rollerdurance is open to everyone, regardless of skill level.